Eugenics, the effort to improve the human species by inhibiting reproduction of “inferior” genetic strains, ultimately came to be regarded as the great shame of the Progressive movement. 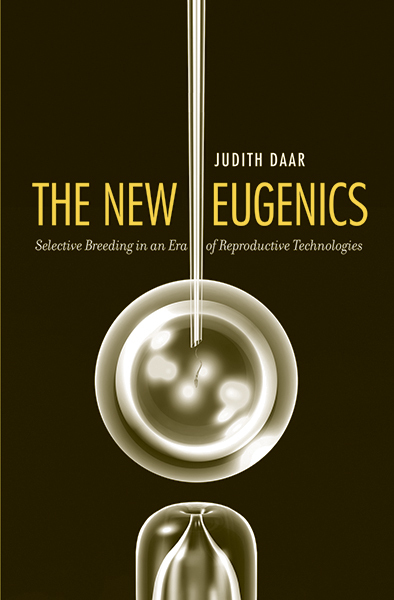 Judith Daar, a prominent expert on the intersection of law and medicine, argues that current attitudes toward the potential users of modern assisted reproductive technologies threaten to replicate eugenics’ same discriminatory practices. In this book, Daar asserts how barriers that block certain people’s access to reproductive technologies are often founded on biases rooted in notions of class, race, and marital status. As a result, poor, minority, unmarried, disabled, and LGBT individuals are denied technologies available to well-off nonminority heterosexual applicants. An original argument on a highly emotional and important issue, this work offers a surprising departure from more familiar arguments on the issue as it warns physicians, government agencies, and the general public against repeating the mistakes of the past. Judith Daar is the interim dean and professor of law at Whittier Law School and a clinical professor of medicine at the University of California, Irvine, School of Medicine. She lives in Rancho Palos Verdes, CA.